Which Daedric cult built these long-lost catacombs? It wasn't worshipers of any of the Four Princes of the House of Troubles. The clues to this secret are found deep within. 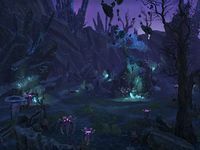 Cold-Blood Cavern is a cave system and Daedric ruin located in northwestern Shadowfen. The entrance is located west of Hei-Halai, in the entrance passage to the Ruins of Mazzatun. 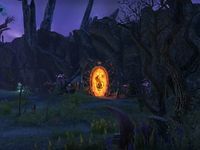 It is inhabited by Skaafin, and contains a portal which links to an unknown pocket realm of Oblivion ruled by Dyzera, who has been imprisoning the Oracles of Azura. 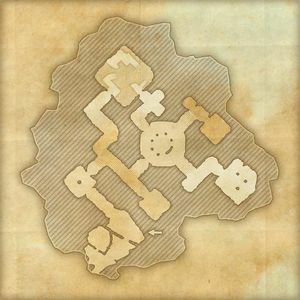 You must free them and defeat Dyzera in the related quest, which is the only time the ruin is accessible. Dyzera Realm is a pocket realm of Oblivion which can only be accessed through a portal deep within Cold-Blood Cavern, which you will open during the related quest. It is the lair of a mysterious Daedra named Dyzera. 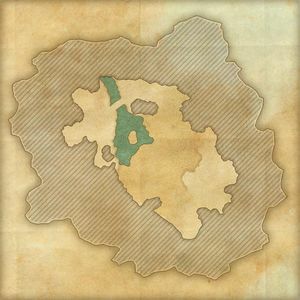 The only notable feature within the realm is an Oblivion Gate in the central glade. This will open when you approach, and three bosses will emerge from it in succession: Herne Ghorev, Kraohl the Defiler, and finally Dyzera herself. After defeating all three, the Gate will shut and a portal will open to bring you back to the entrance of Cold-Blood Cavern. 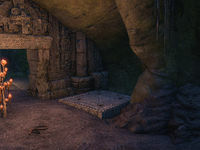 The location is labeled as Bandit Den by a portal within Dyzera Realm. Dyzera Realm is labeled as Pocket Realm by the entrance portal. 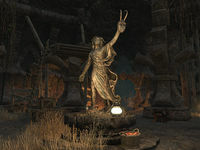 A statue to Clavicus Vile can be found here, with a few Skaafin praying to it. However, compared to the regular model, it lacks a sculpture of Barbas. This page was last modified on 20 June 2018, at 18:38.